Hummingbirds intrigue most of us. Can you imagine holding hummingbirds in your hands? This woman does. (For more info, visit The Hummingbird Lady.) While not all of us can get them to come this close, there are things you can do to entice them into your yard to get a closeup. Your Minneapolis landscape can be a lively hummingbird destination if you choose the right flowers, feeders, and offer water features. Beckoning hummingbirds to your backyard garden can be easy if you choose the right type of flowers in the right environment. There are some key elements that are required to have a successful hummingbird garden. The garden has to be filled with flowers that hummingbirds love. The simplest recommendation is to have red objects hanging and perched around your yard including, red ribbons, red metallic streamers, red gazing balls, or any red object. They are attracted to the color red, so have some red flowers that are blooming all through the warmer months. 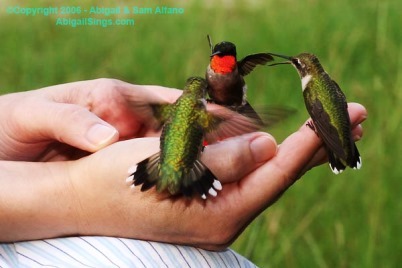 You also should have clean feeders up and ready for the hummingbirds when they return in April and keep them up through October. Use pre-made hummingbird nectar; don’t try to make your own with red food coloring unless you follow a hummingbird nectar recipe. The feeders should be hung where there is cover and there are spots for them to perch and preen themselves. Install a water feature that is shallow. It can be a fountain or a small bird bath; a special bonus is a dripper or misting device like a bubbler. The location for a hummingbird garden should be sunny. Flowers that are brilliantly colored with many small blossoms pointing sideways or down are favorites. The hummingbird flits from flower to flower, so having flowers of different heights – mostly tall – in the garden means the show will be better for those who observe them. Plant flowers in clusters to make a large impact. Hummingbirds like both annuals and perennials. At Architectural Landscape Design we can help you plan your garden beds and the rest of your landscape to fit in with your lifestyle, your home’s design, and the vision you have for your outdoor spaces. Whether you’re looking to attract wildlife such as hummingbirds, or you’d just like a beautiful vista to entertain friends and family, we can work with you to turn your landscape dreams into reality. Give us a call today for a free consultation. It’s not too early to start planning now for next spring.